'Less is More' collaborative mural by MEGGS and ASKEW ONE, with a special appearance by Rick 'Frank' Hayward. Located at 1000 Howard Street, San Francisco. Mahalo to everyone who joined us for the opening weekend of ‘LESS IS MORE: Exploring Mindfulness and Conscious Consumption,’ a collaborative experience that we've curated at First Amendment Gallery in San Francisco! The exhibition is on view until September 1, but if you aren't able to see it in person you can view the full catalogue of artworks here. ‘LESS IS MORE’ opens dialogue surrounding hyper-consumption as a dominant driver of environmental degradation and climate change. This experiential collection navigates between the macro and micro, highlighting the myriad effects that individualistic decisions have on our our planet’s fragile natural resources and ecosystems. Temple Children is an experimental arts and sustainability platform uniting a diverse global community of creatives to generate collaboration for positive change. In search of a collective consciousness, this dedicated group challenges us to look inward and recognize the interconnectedness between human beings and our environments. Thank you to those of you who participated in ‘Creativity as a Catalyst for Social Change,’ an Artist Talk with featured artists, MEGGS, Askew One, Jessie and Katey, Patrick Ethen, and Thing Thing’s Rachel Mulder and Simon Anton on Saturday. We are so thankful for all of the artists involved in the show and are overwhelmed with how many of you came to SF for the weekend to support us! Also, a special thanks to Vicky and our friends at Mr. Espresso for the coffee supply. First Amendment Gallery is located at the intersection of 6th and Howard St. in Downtown San Francisco. The exhibition is free and open to the public. For inquiries for ‘LESS IS MORE,’ please contact info@firstamendmentgallery.com. 'Manufactured Landscapes,' an experiential installation by Jessie and Katey. 'It's a Small World After All,' Mixed Media sculptures by Yoskay Yamamoto. 'The Innocence Between Fire and Flood,' an installation by Aaron Glasson. 'Seascape Migration' (left) and 'Hand Me Downs' (right) by Jessie and Katey. 'Creativity as a Catalyst for Social Change' Artist Talk with Thing Thing's Rachel Mulder and Simon Anton. 'Fake Plastic Trees' series by MEGGS x Thing Thing. 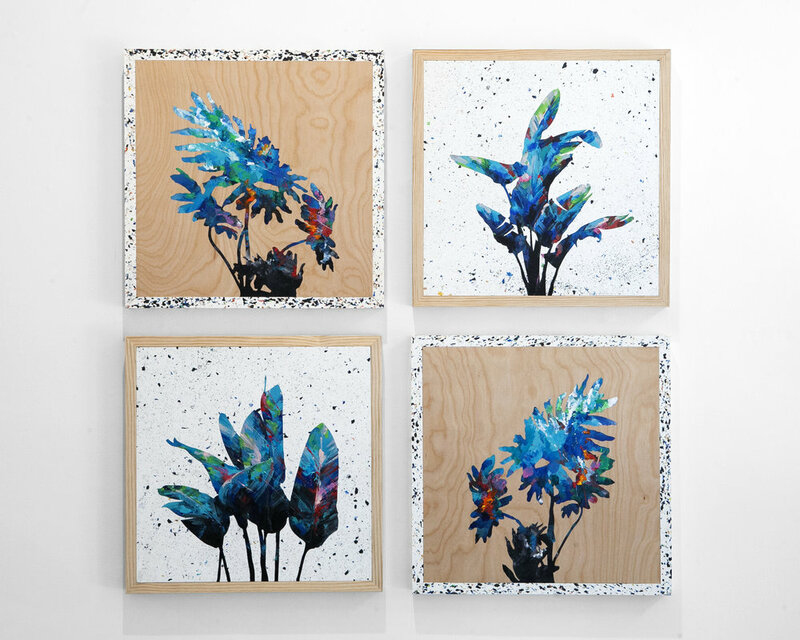 'Symbiotic Relationship' series by Askew One.